So what are the nutritional benefits of nuts? And what part should they play in a healthy diet? Here's an introduction to the benefits of nuts for our health and a look at some of the commoner nuts and their nutritional benefits. Picture, above right: hazelnuts are sweet and nutritious. Picture thanks to pizzodisevo. Nuts and seeds can be a great addition to your diet. They are full of vitamins and minerals and have really good amounts of natural oils too. Then there's a bit of protein as well. All in all, they are some of nature's wonder foods. And they can help towards a greener lifestyle. More and more nutritional benefits of nuts are being found all the time. Eating plenty of nuts can be a real and sustainable way to enhance your green living plans and improve your health. See the individual nut types below for information on their specific nutritional merits. There are loads of excellent recipes which use nuts and if you are vegetarian or vegan they can provide significant amounts of your protein and vitamin requirements. Most common nuts can now be found from organic sources, which helps biodiversity and wildlife. So they can be a great part of a greener lifestyle. They also make a very valuable contribution to vegetarian and vegan dietary choices. - Aha! I hear you say.. those ain't nuts! And of course you are absolutely right. Not a good one to show the nutritional benefits of nuts, perhaps - except that they are one of the commonest "nuts" available and almost everyone eats them! Peanuts, or groundnuts as they are sometimes called, are not really nuts at all. As the name suggests, they grow in the ground and they are members of the pea family or legumes. But they do have a few things in common with nuts so we'll classify them together. Assuming peanut allergy is not an issue for you, what's good about peanuts? Peanuts provide some calcium and useful amounts of potassium and a little niacin (B3). They are about 25% protein and 50% fat, some of which is saturated. The great thing about the protein in peanuts is that all eight amino acids we humans need in our protein intake are present. So peanuts are particularly useful for vegetarians and vegans. OK. On to the real nuts. The nutritional benefits of nuts such as almonds are hard to beat. Almonds are probably the most nutritious of all the common nuts. Just 100 grams contains over 16g protein, 4mg iron, 250mg calcium, 20mg vitamin E and 3mg zinc. Almonds are easy to use in cooking savoury dishes and in puddings. They are a lovely resource for baking, too. They provide great tastes and textures. Ground almonds are great to add to pastries, biscuits and cakes because of the light texture and subtle flavour. Almonds are used extensively by continental cuisines such as French and Italian. It is also possible to make a nutritious nut milk from almonds and you can buy excellent almond nut butters in health food stores. 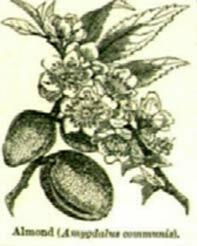 The nut used for eating and cooking is the sweet almond. It is grown in many countries in southern Europe, western Asia, California, south Australia and South Africa though it probably originated in the middle east. Brazil nuts used to be famous for their ability to concentrate strontium 90, a deadly radioactive isotope. Fortunately these days they are better known for providing selenium in the diet. They are also rich in zinc and magnesium and have useful amounts of antioxidants. This means that they can play a valuable part in an anti-aging and anti-cancer diet. Brazil nuts will only grow to maturity in rainforest, their natural habitat. It takes at least 15 years for a Brazil tree to begin fruiting and many trees are still producing at 400 years old, so rainforest destruction is devastating for this industry. It is also important that the rainforest around the trees is preserved; when farmers cut down adjacent trees to grow other crops Brazils often succumb to disease within a few years. A recent scheme has been set up in Amapa, Brazil to help local communities to form co-operatives to cultivate and harvest Brazils. The Brazilian government hopes to preserve more rainforest this way. Brazils are also grown in Bolivia. Cashew nuts are native to South America but these days many cashew nuts are grown in India and Vietnam. The tree is cultivated in hot and humid climates. The outer shell is quite toxic and workers sometimes develop rashes like those from poison ivy. Cashews are related to poison ivy and mangoes and the nut hangs from below a "cashew apple fruit". You won't find these in your local shops, unless you live where they grow; they are not exported because they are so perishable. The poisonous layer of the shell is used in varnish and insecticides and even brake linings. It is quite possible to buy organic cashew nuts; at the Cashew Research Station in Kerala, India scientists have developed organic ways of raising cashews in response to market interest. Cashews are much used in middle eastern and Asian cuisine, turning up in many delicious dishes. They go well with chicken and rice dishes and are used to make subtle sauces. Cashewnut butter is a great nutritional resource if it is produced properly. Avoid butters made with hydrogenated fats where possible; they are harder to digest and much of the vitamin content is lost in the processing, especially the vitamin E.
Cashews are rich in protein and carbohydrates and contain useful amounts of iron, zinc and copper. However, cashews contain a small amount of oxalates. These naturally-occurring substances are found in some plants. When oxalates become too concentrated in your body they can crystallize and cause health problems. If you have kidney or gallbladder problems you may want to avoid eating cashews. Oxalates can also reduce the absorption of calcium, too, so avoid them if you are trying to increase your calcium intake. Cashews are also more prone to carrying mould spores than other nuts and these may provoke a reaction in some people. Hazels are native trees of Europe. Turkey is the world's greatest producer and there are now organic producers there. Probably our prehistoric ancestors made good use of this valuable food. A huge cache of singed hazelnut shells was recently found on Collonsay, a remote and now treeless island in Scotland. 8000 years ago it would have been covered with hazel trees. Stone age people probably turned hazelnuts into a paste or meal which could be dried and preserved. These days hazelnuts are popular as a part of praline and hazelnut and chocolate spreads. There are literally thousands of ways of incorporating them in desserts and savoury dishes. Nutritionally they are full of protein and oils including high levels of monounsaturated fats. They also provide useful amounts of manganese and vitamin E.
The hazelnut appears on the regional flag of Ordu. Hazelnuts bought in supermarkets in Britain are often slightly rancid. If you have the good fortune to spend any time in the middle east you will probably find abundant hazelnuts which are plump and sweet-tasting. Turkish vendors sell hazelnuts ready-shelled and skinned which also helps to make them more agreeable. Many of these hazelnuts come from the Ordu region of Turkey, on the Black Sea coast, which is famed for its nuts. They even have them on the regional emblem! Macadamia nuts are native to Australia and they were a traditional food of the aboriginal peoples of Queensland. They are now grown in Hawaii and California where there are thriving organic plantations. They are extremely difficult to extract from their shells which is probably why they are so expensive. Macadamias have the highest levels of monounsaturated fats of any commercial nut. A recent study at Wesley Hospital, Brisbane found that eating macadamias can lower harmful blood cholesterol. The research showed that eating 6-20 macadamia nuts a day lowered cholesterol by 7% and triglycerides by 25 %. The patients in the control group had a diet high in complex carbohydrates. They also contain a good spread of vitamins and minerals and of course, they are absolutely delicious. Walnuts are known for the high amounts of essential fatty acids they contain. These essential fatty acids are mainly in the form of polyunsaturated fatty acid - the much touted ingredient of vegetable oils and margarines. When you consume these "PUFAs" in a nut there has been no harmful chemical extraction, nor any hydrogenation process to undermine the nutritional benefits! Walnuts have recently been found to have remarkable health-giving qualities. If you eat a few walnuts after fatty foods such as lamb or beef, the saturated fats are dispersed by the Omega 3 fats from the walnuts. The trees are natives of Europe and were probably introduced to us northerners by the Romans. The tree grows extremely slowly. We used to have a young struggling walnut tree when we lived in Wales. The poor thing only just managed to get its new leaves out by August in that cool damp climate! 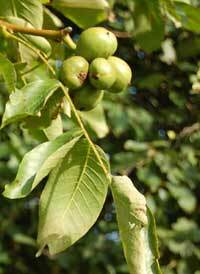 Wild walnuts can be found in southern England and in Europe. Walnuts grow quite well in southern England and the nuts are sweet and juicy when bought as "wet" walnuts. Some farmers are now re-introducing walnuts as a viable crop. The outer skin of the nut - the green coat - turns black when dried and can be used as a non-toxic hair dye. I haven't tried this yet! You can buy natural hair dyes which contain walnut skin extract. Organic walnuts are widely available. Many nuts are best stored in your fridge. Being high in fat they can quickly become rancid. It's also better, where practicable, to buy them in their shells. They will keep better and for longer that way. So take advantage of the nutritional benefits of nuts by including plenty of them in your diet wherever possible. They're good for us and the planet and amazingly tasty too! A Homemade Muesli Recipe for the Best Breakfast!